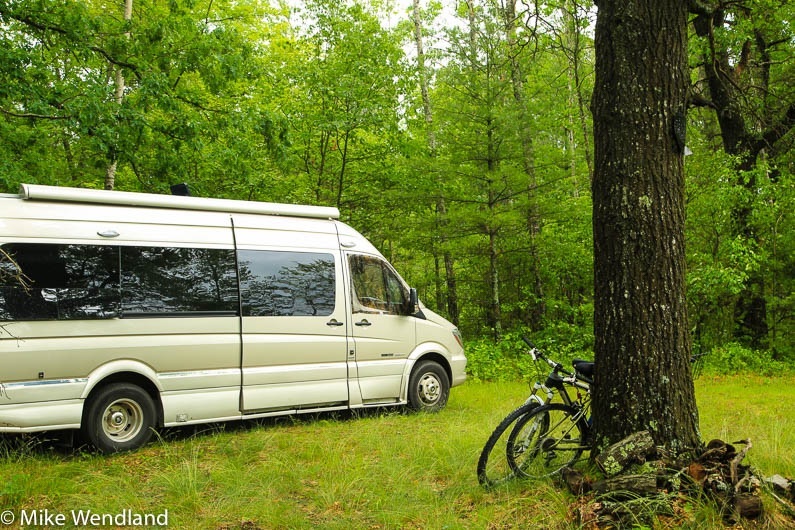 Experience Total Independence While RVing Off Grid! This is the story of Jennifer and Mike Wendland, an adventurous couple who have been traveling around the country since 2012. In that time they have traveled over 70,000 miles! Those kind of numbers are impressive in any RV, but in a small class B motorhome, it’s truly amazing. 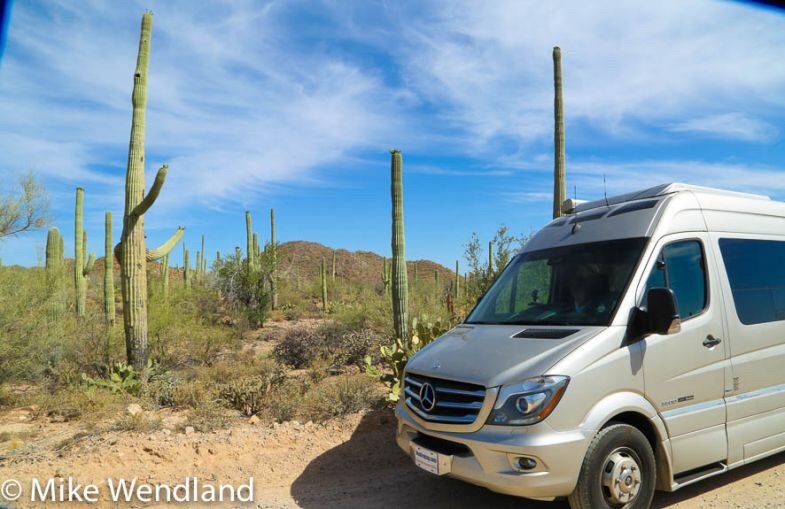 The Wendlands travel in a Roadtrek CS Adventurous XL Class B, van-style Motorhome. It’s 23 feet long and just under 7 feet wide. providing them with about 150 square feet of living space. Inside they have a bed, a galley kitchen, a mini coach, and a wet-bath. The Wendlands don’t travel full-time (gotta spend time at home with the grandkids), but on average they can be out and obout in the Roadtrek about but 2-3 weeks of every month. One of their passions while traveling is living off the grid. 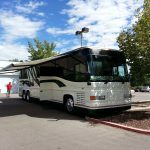 They chose their RV based on its ability to be self contained and not rely on outside power sources. They have a 650 watt solar system on the roof, lithium-ion batteries, and a built in generator. With this set up they quickly realized that they had more than enough power and didn’t need campground hook-ups. With off grid living a new reality they were free to travel anywhere and everywhere! Since they travel in all seasons, it was important that their off grid set up could withstand a wide range of conditions. The put the system to the test when traveling through Zion National Park where the outside temperature soared to 107- degrees. Believe it or not they were able to run their air conditioning from 11 am to 10 pm, all from solar! Their Roadtrek stayed a cool and comfortable 75 degrees. This meant that their dog could stay in their rig without them having to worry. In the meantime, they were free to explore the park and return to a nice cool van. While boondocking all over the country they always had enough power to cook, work on their computers, and run their satellite as needed. Power was never and issue. In fact, they nearly forgot all about it. The lithium-ion batteries in their Roadtrek provide an incredible 20,000 watts of power! Unfortunately, this set-up is not yet available to the general public. The Wendlands have been testing it since December of 2014 to see if it’s a feasible type of power for the average RVer. Along with the solar and batteries, the Roadtrek is also outfitted with a new engine generator that automatically switches on when the batteries are running low. Just think of the financial savings. With a system like this there is no need to pay RV or campground fees ever. You can boondock anywhere you want. Travel to the mountains, the national forests, or the open desert. Discover travel the way it was meant to be. Keep your expenses to a minimum and park away from the crowds. WOW. A Class B with an off grid solar set up means total freedom wherever you roam. Here’s another example from their trip. Four miles from the Grand Canyon North Rim the couple dry camped in the national forest. While the park was packed, the Wendlands only neighbors were the elk that walked through the grass. They lived like kings using their kitchen appliances to make delicious meals and enjoyed the peace and quiet few get to experience. On another stop they boondocked in the woods of Michigan. The nearest road was over a mile away. They camped in a small clearing that overlooked the river. Then came the storm. Rain and winds swept through the woods, but Mike, Jennifer and Tai were inside watching Netflix, reading books and drinking hot chocolate. The Roadtrek kept them dry and free from bugs. Yep, living off the grid is pretty great. So after all those miles, what have the Wendlands learned? They discovered that true freedom comes when you are less dependent on your surroundings and able to go where you want, when you want. When electricity is taken out of the equation, a whole new world of opportunity opens up. Class B Motorhomes aren’t for everyone. They are super compact and require two people who are very flexible. On the other hand, look at all the opportunities available when you travel in a class B. No camping spot is too small, and stealth camping can be accomplished even in the busiest of cities. What do you think? Would you like a Roadtrek with an off grid set-up? Leave your thoughts and comments in the box below. We always love hearing from you. Like this story? Share it with your friends. Tweet it, pin it, like it, post it. Help us spread the work. Thanks!